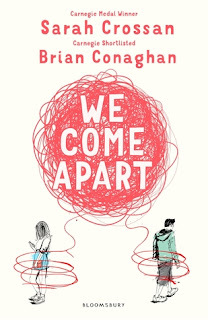 And this book, We Come Apart, written by Sarah Crossan and Brian Conaghan is very intriguing. I've read books by Sarah Crossan before and loved everything she's written and also read the one book by Brian Conaghan and found it very unusual and interesting. This pairing isn't one that would spring to mind naturally, but I think it worked very well. We Come Apart is a novel told in verse. I love verse novels, I think they manage to convey so much depth and emotion in fewer words and I'm usually in awe of that fact. This book manages that very well. Some of my favourite poems were quite short but each word managed to hit a place in my heart. This is a dual-perspective verse novel told in alternating chapters from the two main characters. Nicu is a Romanian immigrant in the UK with his family. His parents are hoping to earn enough money for Nicu to return home and marry, though Nicu is struggling with the limitations on his future. And Jess is also struggling in her home life that is overshadowed by an abusive step father. The pair meet after being caught shoplifting and sentenced to community service. I think one of my favourite aspects of We Come Apart is how subtly it engaged my emotions. As in, I wasn't fully aware of how much I had to come to care for both Jess and Nicu until something more dramatic began to happen in the last quarter of the novel that made me realise that what I was feeling was shock, anger and devastation. My only complaint about this book is that I wanted it to be longer. Well I appreciated the ending that this book has, I also wanted more. I wanted more of these characters and to learn more about their stories.